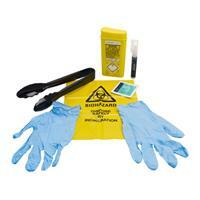 Our Sharps Kit aids the safe removal, containment, disinfection and disposal of discarded needles and syringes. These sharps kits are ideal for Cleaners, Waste Removal Contractors and Building/Maintenance Contractors working in Social Housing and other locations where discarded needles and sharps may be present. 1 x Disinfectant spray (8ml). 1 x Disposable gloves (pair). 1 x Sharps container 0.2ltr. Our Sharps Handling kit is incredible value and probably the cheapest kit available enabling you to protect your staff from the risks presented by handling and disposing of sharps and needles.